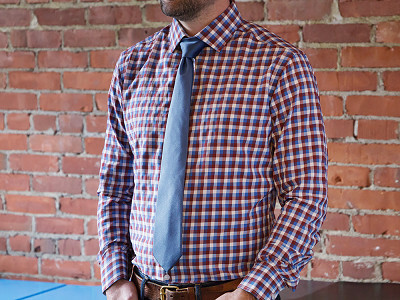 State and Liberty is changing the shape of men’s dress shirts—to fit athletic builds. 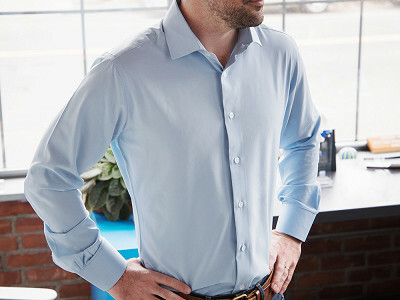 Their men’s performance shirts have a slimmer fit for broader shoulders and muscular arms, as well as a narrow waist. Made with professional-looking fabrics that work as well as they look, these shirts have stretch, wick moisture, and resist odors, too. The collars, cuffs, and plackets are double fused with stiffening fabric that fights wrinkles and also helps regulate body temperature. When Founders Lee Moffie and Steven Fischer entered the working world after college, they searched in vain for professional clothing that fit their athletic bodies. In creating their own shirts, they focused on a tailored cut with breathable, stretchable fabric. If you’re getting in a pre-work workout, State and Liberty’s shirts resist wrinkles in your gym bag. And for post-work socializing, the styles are at home outside the office. Now there’s no hiding in boxy button-downs—or squashing into too-tight ones, for that matter. This shirt is just the right fit for fit guys. Hello Grommet! My name is Lee Moffie and I am a Co-Founder at State and Liberty Clothing Company. We set out on this journey to provide athletically built males the fit, feel, and professional look that they deserve in a dress shirt. We are very excited to be featured on The Grommet and even more excited for you to check out our dress shirts. I look forward to hearing from you and answering any questions that you may have. Thanks! Hi Lee - I'm very excited about this product as my boyfriend is a triathlete (and two time Iron Man!) and has challenges fitting in dress shirts. He also wears cuff links often. Would you consider making a french cuff version? @Darian Hi Darian, thanks for reaching out. Your boyfriend is going to absolutely love our shirts. We are going to be coming out with a french cuff version of "The Fisher" white shirt in a couple months. I would reach out to the grommet and suggest they carry it when we come out with it. You can also follow us on social media @stateandliberty and get onto our email chain via our site to get the latest up to date activity on our products. Thanks again for reaching out and I look forward to seeing how your boyfriend likes the dress shirts! @Lee Awesome news - thank you for the info! This will be an excellent Father's Day gift. I am glad you are trying to create comfy clothes for men, however, the tight look, just like that being put forth for women is soooooo uncomfortable looking. Gapping buttons and seeing muscles through the shirt is such a turn off. @Barbara C. We agree! Which is why we set out to make a great tailored looking shirt that has minimal excess fabric hanging off the body. We always had an issue with shirts that would fit us well in the waist would be way too tight in the chest and the button would be pulling, not a good look! Thanks for reaching out. Too bad they only come in athletic cut. I'm "regular" cut. I have some other performance fabric shirts and I travel. They're great. No wrinkles, dry quickly. Let me know if you expand (in all aspects) your shirts to include regular cuts like for most men. @Richard Thanks for your comment. We felt like no one was truly providing that athletic fit which is why we wanted to be different with our cut in comparison to what other companies are doing. Be sure to follow us on social media or get on our email list via our website to stay up to date with out products as I am sure as we grow as a company we will be open to more cuts. Thanks Richard. @Pat Hi Pat, thanks for reaching out. Our policy is to not comment on other brands in a similar space, but we like to think we separate ourselves from all companies in two ways. By providing a true athletic fit and providing an extremely professional looking dress shirt. We provide more room in the shoulders chest and arms and have a really tailored waist along with darts in the back there is very limited excess fabric hanging off the body. The second is going to the be cuffs and collars, which have been double infused with stiffening fabric to provide a crisp, sharp looking collar that does not get sloppy and stands the test of time after washing. These look great, but I have two concerns - neck sizes, and there seems to be no option for tall, athletic men. Do you have other sizes? Thank you. @Alexandra Thanks for reaching out. Our neck sizes run a little larger because we are making shirts for athletically built guys. If you are worried about the neck being too small our shirt collars to have a little stretch and can help gain an extra .25 inches. As for the tall sizes, I would encourage you to to follow us on social media or get on our email list via our website to stay up to date with out products as tall sizes are currently in the works and will be coming out in the upcoming months. Thank you! Is there a size chart? Am I missing it? What are specs on small and medium? @Jane - We have a sizing chart listed as a link under the product details but you can also view the size breakdown here. My son is fit though not a body builder. He really likes a close fitting shirt, tailored shirt. His problem is always sleeve length...most are too short. @Carla Hey Carla and Diane, thanks for reaching out! You can find our size chart below - let me know if you have any more questions! State and Liberty is changing the shape of men’s dress shirts—to fit athletic builds. 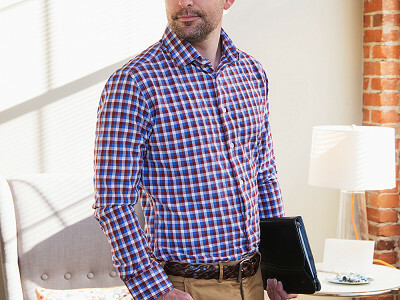 Their men’s performance shirts have a slimmer fit for broader shoulders and muscular arms, as well as a narrow waist. 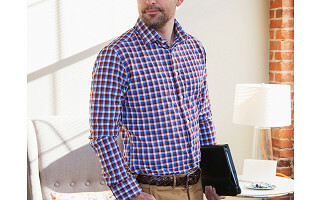 Made with professional-looking fabrics that work as well as they look, these shirts have stretch, wick moisture, and resist odors, too. The collars, cuffs, and plackets are double fused with stiffening fabric that fights wrinkles and also helps regulate body temperature. When Founders Lee Moffie and Steven Fischer entered the working world after college, they searched in vain for professional clothing that fit their athletic bodies. 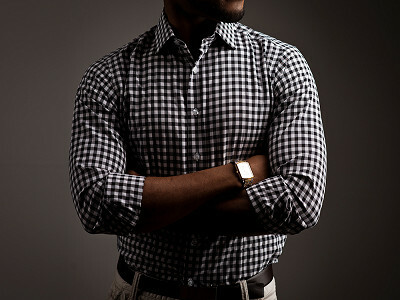 In creating their own shirts, they focused on a tailored cut with breathable, stretchable fabric. If you’re getting in a pre-work workout, State and Liberty’s shirts resist wrinkles in your gym bag. And for post-work socializing, the styles are at home outside the office.